Everyone is talking about today’s solar eclipse. It’ll draw its dark line diagonally across the US today, but the inky darkness will bleed out across most of the country– even those of us who aren’t in the line of total eclipse. It’s been the big story for days now, leading a news cycle that has contained other chatter that included stories about North Korea and Russia: a big old stew of news that brought to mind two posts from a couple of years ago; posts about Moon Pies, Cold War, Russians, and North Korean politics. Strange bedfellows, maybe . . . maybe not. 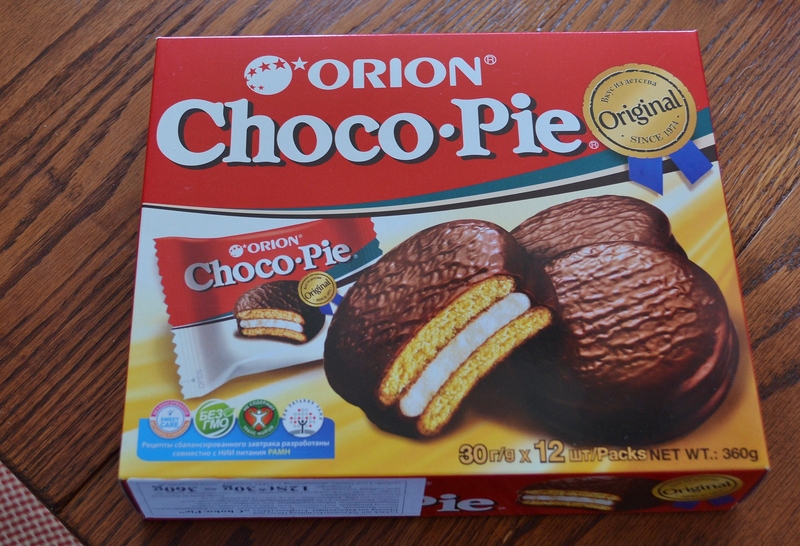 Seemed an appropriate time to bring out that original post (Moon Pies and Moon Landings), as well as it’s follow up on the saga of Choco Pies in N. Korea. Happy reading, bon appetit, and Godspeed on eclipse day! I began writing this post under the title “The Perks and Perils of Shopping Abroad.” However, I soon realized that the insights you are about to read are much broader than my mishaps in the grocery aisles. The larger story starts in the years after the Second World War. (Or even after the First World War and the Bolshevik Revolution.) 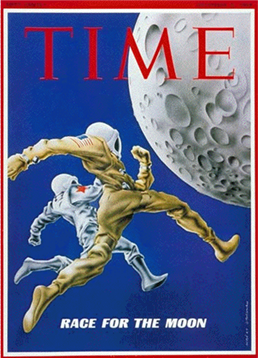 It gains steam in the Cold War and the Race for Space. However, the more immediate story starts in the aisles of my local German grocery store, Edeka. And like the larger story of political machinations, it’s fraught with perks and perils. For example, it was recently brought to my attention that the lovely, fragrant German laundry detergent I’ve been using for about three months is actually fabric softener. Who knew? Well, in fact, I had suspected for a few weeks. My clothes were so fragrant and soft! But were they clean? Well . . . they weren’t not clean. These things happen when you shop abroad. But great things happen too. This morning, I was meandering the aisles of our grocery store, picking up jam, sorting through coffee, and pondering fish, when I stumbled upon the most amazing thing on an Eastern European/Russian shelf. Moon Pies! Well, okay, Choco-Pies–but they were Russian Moon Pies! Eureka! 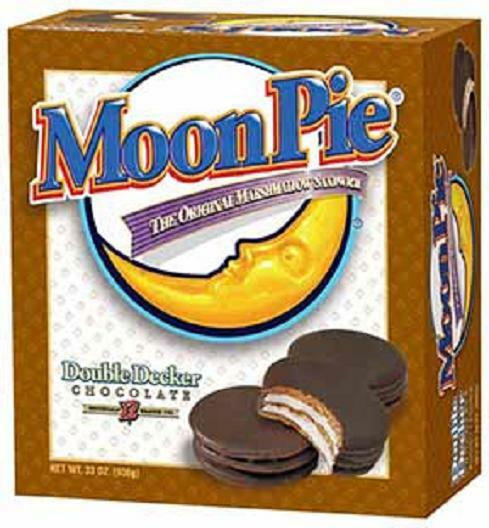 For all of you non-American (or non-Southern) folks out there, here’s a little lesson: Moon Pies are chocolate, graham, and marshmallow pies that are a Southern staple and made in Tennessee. Before the markets were flooded with snack cakes and convenience food, there was the Moon Pie. Apparently, they were produced beginning in the 1920’s and they were certainly big stuff in the sixties and seventies. (My mother loved to pack my lunch with Little Debbie Oatmeal Cream Pies, but my heart, and my taste buds, yearned for Moon Pies.) They were iconic. And delicious. And here I was, in Germany, staring down a Russian doppelganger! At first I laughed, and then I greedily stuffed a box into my shopping cart! I considered my good fortune as I walked the streets of town, heading home with my grocery bag and its treasure. But as I walked, I started thinking about more than my good fortune. I started thinking about the doppelganger-ness of the little chocolate pie: the shadowy counterpart, the ghostly (and ominous) double. The American Pie/the Russian Pie: forever locked in a shadowy dance. For sure, I’ve watched too many episodes of “The Americans,” the Cold War spy drama, lately. But my odd brain was playing out this Spy v. Spy (Pie v. Pie) drama and finding it fascinating. By the time I got home, I was mad to know more. I ripped out the Choco Pie box and scanned the label for clues–amongst the Cyrillic (Russian) script and German sticker stood out something I could decipher. Original since 1974. Ha! It wasn’t the original then–we got there first. Not only did we get to the moon first*, but we got to the moon pie first. I chuckled as I opened the box and saw that the pies were smaller than their American counterpart. Well, what did I expect. But then I took a bite. Oh my. I took another bite. They were delicious. So fresh, so chocolaty. I felt conflicted in my patriotic soul. There had to be an explanation for this; no way the shadowy double could rival the Southern staple. Think, think! (Take another bite.) Think some more! Oh–of course–the problem is that too many of the American Moon Pies I’ve eaten have been plucked from dusty lower shelves of rundown convenience stores or seedy Stuckey’s truck stops. Who knows how long they had lingered there, gathering dust and grime? That’s it. That must be it. I was raised in the 70’s with a taste for Moon Pies and Tang. In my mind, that era will always be about playing kick the can, catching fire flies, eating Moon Pies, and drinking Tang like the astronauts. 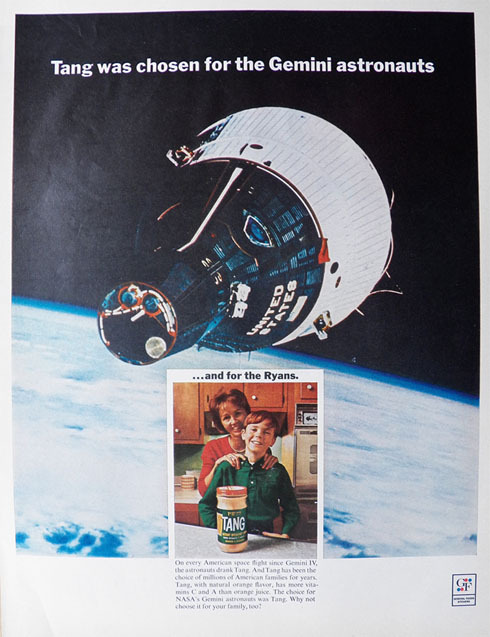 I remember some of the Apollo missions; I coveted the GI Joe astronaut dolls (Barbie never had the astronaut get up, although her house and pink convertible weren’t too shabby); and I marveled when Skylab sustained people and research in space. I didn’t cheer on the Cold War or Nuclear Proliferation– they scared the hell out of me– but I was a product of a culture and a time. I didn’t know whether I was an observer or participant, but I felt the adrenaline of the Race. The Race for Hearts and Minds, the Race for Space, for Superiority, for Survival. And then I tucked my head down into a Moon Pie or Mad Magazine and took refuge from the noise of it all. Only to find today that, maybe– just maybe– my youthful Soviet doppelganger was doing the same thing in 1974. Only she couldn’t call her treat a “Moon Pie”. . . because we got there first. Just another lesson learned at my German grocery store. *Sort of. We put a man on the moon first. But before that, the Soviet Sputnik program beat us into outer space and the Soviet Luna program reached the moon with unmanned crafts. This may come as a shock, but apparently my Moon Pie post was not as loopy as it sounded to many of you. Turns out Moon Pies (or Orion Choco-Pies, their Russian/Asian doppelganger) really are a propaganda piece in the machine of Cold War. The present tensions between North and South Korea, that is. My sister sent me a link to this very interesting article from The Daily Mail (UK)–looks like it was published today. Well, Mr. Kim Jong-Un, the joke is on you. You are just putty in the hands of the universal Moon Pie awakening. Your excellent post reminded me of a post I wrote on Coke and Choco pies in North Korea. The Daily Mail article you refer to is from 2015. I’ll have to read your post– look forward to it. And, yes, as I mentioned, this was a re-run of two posts I’d originally written in June 2015. Still, with the eclipse and the international shenanigans afoot, it seemed appropriate to re-run it. excellent! so there’s another chocolate war now too?it’d be kind of funny if it weren’t for the threat of the real war unfortunately. So true. All the more reason to break out the chocolate! Well then, you have some catching up to do!! It’s high time you tried one. Just make sure it’s a chocolate moon pie; occasionally you stumble upon banana or cherry flavor– not so good. Well well. But are Moon Pies REALLY delicious, or just stuffed full of happy memories? You’re on to something there. But, after all, happy memories are delicious! I haven’t eaten one in years, but I do like Moon Pies. They’re a lot better than their British equivalent of teacakes – teacake marshmallow is way too soft for my tastes! I’m a bit envious of everyone who got to see the eclipse; seems like my Facebook was flooded with eclipse photos from all my friends in America. Teacakes are very sweet, I agree! I like a single bite– then I’m done. We are in DC and the eclipse wasn’t a very pronounced event here, but some areas of the country had a great view! I don’t think I have ever had a moon pie but they look good. They are pretty good for a store bought treat. When I was young, I absolutely loved them– these days, I enjoy one every now and again and I think the nostalgia is a large part of the appeal. I want to try one now!